Jazzfest 2019 at Café Istanbul kicks off in grand style at with one of the most unique rockin', funkin', hootin'-and-hollerin', danceable party bands New Orleans has to offer. Think The Band's Big Pink album and add a splash of hot sauce with "Willin" by Little Feat, and this group of New Orleans vagabonds nails it. From the pristine waters of the Honey Island Swamp, to the vibrant streets of New Orleans, to the hazy corner of Haight-Asbury in San Francisco, the Honey Island Swamp Band has endured devastation, relocation, and revitalization. A group whose sound has been tagged "Bayou Americana", the band takes the hammer to the nail with the help of producer Luther Dickinson on its release Demolition Day on Ruf Records. 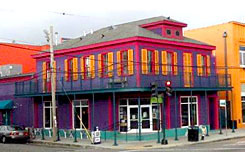 Recording at the Parlor Studio in New Orleans, Honey Island Swamp Band teamed up with producer/musician Luther Dickinson of the North Mississippi Allstars to capture a rhythm and a feel born straight from the heart of Americana. The album features a host of New Orleans' finest musicians, including guest appearances by keyboardist Ivan Nevilleand guitarist Tab Benoit on pedal steel. "We're diverse and complex people," explains Chris Mulé, the band's guitarist, "and our audiences are as well. So we try to let our music reflect that." Drawing from their diverse backgrounds, the band's lyrical content is quite colorful. "They really are all over the map," Aaron explains of the topics explored on Demolition Day. "Some are rooted in reality and personal experience. 'Head High Water Blues' is a look back at the Hurricane Katrina experience now that ten years has passed. Much has been rebuilt, but much has not and never will be and the song is more about the emotional scars that can never be fully erased. Others are just fiction and storytelling. We had the music for 'Through Another Day', and it sounded sort of old and epic and Southern, and that inspired this Civil War-era storyline that became the lyrics. Others are just sort of playful nonsense about life and relationships, like 'Watch And Chain'." Demolition Day is about rebuilding more than tearing down. It's about a renewal of purpose, reflected through powerful lyrics and stories, great slide guitar on top of deep bass and rhythms that continue to move the foundation upon which the band was built. New Orleans has a deep well of music, and that well has no rules -- the only boundaries are the ones that we place on ourselves. Honey Island Swamp Band breaks all boundaries to deliver a sound so relevant and honest that even in the darkest of days (like the violent storm that brought this group of musicians together), the glow of their addictive, unique and infectious grooves still shines brightly.